Greer's OC | Negroni Week, 7 days, 3 ingredients, 1 simple way to give back! Negroni Week, 7 days, 3 ingredients, 1 simple way to give back! Negroni Week, presented by Imbibe Magazine and Campari, launched in 2013 as a celebration of one of the world’s great cocktails and an effort to raise money for charities around the world. Negroni Week grew from about 100 participating venues to over 7,700 venues globally, and have collectively raised nearly $1.5 million for various charitable causes to date. From June 4-10, participating Negroni Week bars and restaurants will be mixing up their best Negroni concoctions, all while spreading awareness for their favorite charities. Inspire Artistic Minds is hosting the fourth annual Negroni Week Launch Party and Competition at Mesa in Costa Mesa on the evening of June 4. This event is a celebration of all things Negroni creatively presented by some of the best bartending talents in Southern California. During the event, eight SoCal bartenders will prepare their signature Negroni for a judging panel of cocktail aficionados and industry leaders, and hope to take home the win. This year’s judging panel includes: Jason Schiffer and Gabby Dion of the Orange County Bartender’s Cabinet, the respected and award-winning bartending behemoth Erick Castro, Paulina Valdez from Campari, and Anne Marie Panoringan of OC Weekly. The winner will not only earn the First Place title, but also an educational scholarship provided by Inspire Artistic Minds. The participating bartenders must use the following ingredients: Campari, Bols Genever Gin OR Bulldog Gin, and their choice of Sweet Vermouth; beyond that, they are allowed to be as creative as they wish regarding additional ingredients, presentation, and flair. A few of the Orange County bars participating include Playground, The Blind Pig, Vaca, and Vacation Bar. All in attendance at the Launch Party will make a $10 donation, and will be able to try a sample of each of the Negroni creations, as well as the opportunity to vote for their favorite. Guests will sip, smile and enjoy music throughout the evening as well as a variety of small gourmet bites courtesy of Mesa. 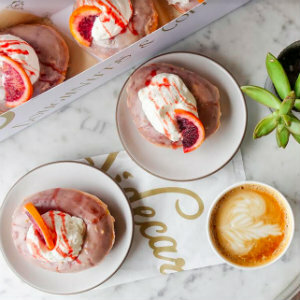 The Blood Orange Negroni Doughnut — In honor of Negroni Week, Sidecar Doughnuts will be premiering an exclusive Negroni-flavored doughnut at their flagship Costa Mesa location. The Blood Orange Negroni Doughnut: Sidecar's signature bullseye doughnut topped with a gin-orange glaze, blood orange curd, a dollop of vermouth whipped cream and a drizzle of a house made Negroni reduction. Visit Sidecar Doughnuts in Costa Mesa from June 4-10 to get a taste of this one-of-a-kind creation ($5.50). Swing by the Negroni Week Launch Party at Mesa on 6/4 -- first 250 guests to arrive can claim a ‘Free Doughnut Card’ to cash in at Sidecar that week! Mesa is at 725 Baker St. in Costa Mesa.